The old part is a 300 year old farmhouse built from "en Pierre" (large stones from the local valley) and the walls are 60 cm thick. This home has been completely renovated, with respect for the ancient architectural styles. Downstairs is a large cozy living room with fireplace and TV with Dutch channels. In the same room is an open kitchen which is fully equipped (4 plate stove, oven, microwave, dishwasher) and utility room (washing machine and toilet). Upstairs are three bedrooms (1x single bed, 1x double bed, 3x single bed) and a bathroom with toilet, shower and double sink. The new section was built with love and passion in 2000 when our home for life in France. A wonderful combination of old beams and modern kitchen, a cozy house !! From the entrance with awning in front of the house, you enter the main hall with toilet, open staircase and a passage to the living area with open plan kitchen. The living room has a large dining table, sitting area, fireplace and a TV with Dutch channels. There is also a utility room with dishwasher, microwave, fridge freezer and washing machine. Upstairs find a spacious double bedroom with contiguous 2nd bedroom (1x single bed) and bathroom with bath, shower and toilet. On the landing are two single beds. The holiday home is near the quiet village of Frayssinet. This village is located in the department of Lot and is located in a rugged forest area of ​​the region Midi-Pyrénées. The street, or at the very French "rue", which is to partially paved, but very accessible to cars. The front overlooks a valley, which can give a nice spectacle during the summer evenings of different natural colors. Even if there's still hanging morning mist in the valley of the meadow. Since 2005, this part of France are easily reached by car via the A20. This (toll) road runs through a large nature reserve around with left and right incredibly impressive views over valleys. This nature reserve is the Parc Naturel Régional des Causses du Quercy. In this beautiful piece of nature flows among others by the rivers Lot, Dordogne and Cele. This means there is plenty of opportunity for water sports. The nature invites you for a brisk walk, a bike ride, a ride on horseback and even a round of golf. is pretty central to drive to various attractions by car. It is highly recommended to also encourage you to visit several markets in the area. You might even consider a day in the Pyrenees? 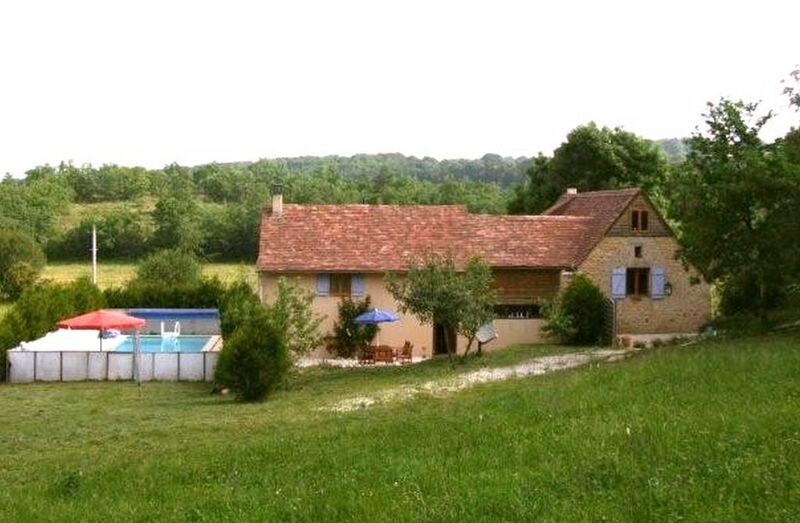 For your orientation: Situated close to the sites: Cahors, Gourdon, St Germain du Bel-Air.